"Now we're dealing in threats! I feel so important. I wish you had done this last week. Aunt Agatha was in town, and I thought I would die from boredom." Perhaps you will recall that i left your home without a word of good-bye, and for this you must pardon my poor manners. I find myself averse to being trapped in doorless rooms, to say nothing of being methodically tortured. It is a character defect owing to my savage ancestry. I turn to leave but he catches my hand in his. He looks up at me with dark eyes open and sincere. "Thank you for giving me another chance." "Thank you for deserving one." Eleanor looks up for her own letter writing. "How did she describe me? Because I have always preferred my eyes to be referred to as the 'color of a storm-tossed sea.' If either of you were wondering." "You did not fare much better. In fact, I think I am ahead. I am a 'dear friend,' and you are merely 'recently ill.'"
Illusions of Fate is exactly the novel I was looking for. I'd been stuck in the rut of either DNFing a book or just all around not enjoying it. I had hoped this novel would pull me out of it as it contained some of my favorite literary factors and luckily for all involved, it did just the trick. Jessamin is an exceptionally strong female character. Growing up on the tropical island of Melei, her mother had her taught in all the ways of Albion society, language, and customs. In need to escape a marriage her mother hoped to arrange, Jessamin travels to Albion to study at college. Unfortunately, despite her high marks, teachers look down their nose at the her and she is ridiculed as an "island rat" by her fellow peers. After being pulled into Finn's world, and learning of Lord Downpike's treachery, Jessamin's character becomes an even stronger and more determined character. Where before she acted on more selfish reasoning, she soon changes her tune to look out for the greater good. I love her narrative voice, she's definitely sassy, and watching her character develop with each turn of the page. Aside from Jessamin, the additional characters truly stand out. Eleanor quickly became a favorite character of mine and I think she knows more than she truly lets on. She's also very upfront and states that she is the biggest gossip of society and simply adores being so. Being of noble birth, she is not ignorant of the world Jessamin has found herself and becomes a great friend and an ally against Lord Downpike. The world building is exceptionally well done, and the narrative beautifully written. While the countries and setting are from Kiersten's own mind, it is easy to see the parallels to real countries. Additionally, it was not difficult to keep up with this world we've never been privy to. I've read books before where the author has described these new things and I've had to reread paragraphs because it is beyond confusing and nothing make sense. Or they do not explain enough and I'm equally lost and confused. This is not the case with Illusions of Fate. It is easy to follow along to the plights on this world, but nor is it overly simple. While I enjoyed the plot, I did feel there were times when it dragged a bit, especially in the beginning. This is not an action packed novel, but nor is it a novel where you're just sitting around waiting for something to happen. It took me a bit to get hooked, but once I was - oh buddy! It's a slow build to a jaw dropping ending that I could not have enjoyed more. 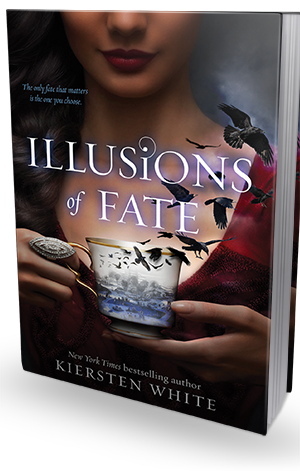 Filled with witty dialogue, intriguing characters, a sweet romance, and an intriguing mystery, Illusions of Fate is a novel for any reader who loves a good mixture of historical fiction, magic, and romance.